Guard Oil is certified to provide fuel to any size marine vessel. We are one of the very few companies in the region to be US Coast Guard certified, which allows us to provide marine fueling services. Our commercial marine services fleet provides top quality marine fuel delivery directly to commercial vessels. Located just five minutes from New Bedford Harbor, the largest fishing port in the United States, we deliver products via truck to fishing boats, marine research vessels, marine yards and other industry-related clients. 24-hours a day, 7-days a week, Guard Oil proudly provides the same level of fuel delivery services to the marine industry as we do to our commercial and residential customers on land. 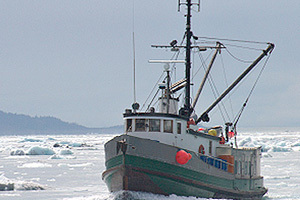 Over the years, Guard Oil has provided services to commercial fishing vessels and yachts of all sizes. We have the ability to fuel boats over 10,500 gallons with our commercial marine services. Our team is seriously dedicated to providing the very best in service and safety to each and every client we serve. All personnel are trained to the requirements of the US Coast Guard. We can provide top quality marine fueling services day or night, offering a simple payment process and accepting all types of credit cards. Our drivers are highly trained and experienced, providing top notch services to our clients. Contact Guard Oil today and get a free, no obligation quote for your commercial marine services. Our team of highly trained and experienced team members can provide you with the very best marine fueling services available in the Southeastern Massachusetts and Rhode Island region. We provide services from Cape Cod to Providence and all along the coast. Give us a call at 508-992-3030 and speak with one of our customer service agents about our commercial marine services and other commercial service options.